Juan Pablo Montoya believes that Formula 1 should look to motorsport in the USA for ideas to help re-engage fans. The Colombian, who won seven grands prix with Williams and McLaren between 2001 and 2006, returned to IndyCar with Penske this year after a seven-season stint in NASCAR. While IndyCar has faced its own struggles to recapture an audience that it lost after the IRL/CART split in the mid-1990s, recent signs have been encouraging. IndyCar's TV figures have shown significant and consistent growth this season, and the current technical package allows for excellent racing without the need for contrivances. The series is also fan-friendly, with drivers actively engaging with fans via social media, autograph sessions at all races, and accessible paddocks. While Montoya believes that F1's current problems are more complicated than mere accessibility, he says that some of IndyCar's practices could serve as an example for F1 to follow. "Number one, F1 has to change the sound," he said. "It is a really hard compromise because they all talk about saving money, but at the end of the day F1 has never been about that. "They still spend all the money in the world. One team there could probably sponsor the whole series here. 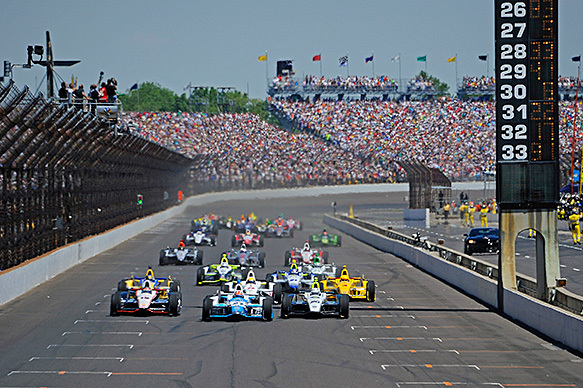 "[But to get fans engaged,] they ought to look at IndyCar. I think IndyCar does the best job of looking after its fans. "It's very different [for fans], just walking around seeing the cars. In the garage in NASCAR, the drivers are never there. "The cars are there but the drivers are always in the motorhome. F1, [the paddock] is always closed. It's so complicated. There is no right answer. "But the people that best understand it ... NASCAR is the best at understanding that at the end of the day it's a show. "Formula 1, being very European, they think it's a sport. And it is a sport. But the way it's played ... the fans have to like it."